Heat 2 tablespoons of olive oil over medium heat in a large, heavy pot or Dutch oven. Add the pancetta and cook over medium-low heat for 6 to 8 minutes, stirring occasionally, until lightly browned. Add the tomatoes, 6 cups of the chicken stock, 1 tablespoon salt, and 1 1/2 teaspoons pepper to the pot. Bring to a boil, then lower the heat and simmer uncovered for 30 minutes, until the vegetables are tender. Add the beans and cooked pasta and heat through. The soup should be quite thick but if it’s too thick, add more chicken stock. Just before serving, reheat the soup, and add the spinach. Cook just until the leaves are wilted. Stir in the white wine and pesto. Depending on the saltiness of the chicken stock, add another teaspoon or two of salt to taste. 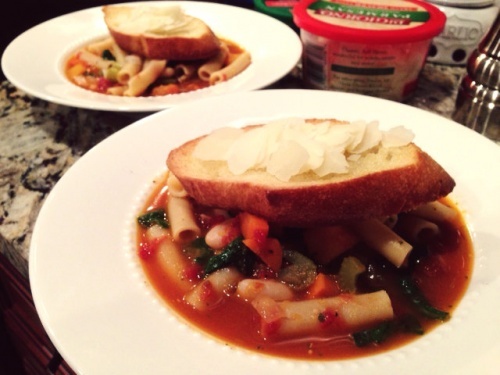 Serve large shallow bowls of soup with a bruschetta on top. Sprinkle with Parmesan cheese, drizzle with olive oil and serve hot. Slice the baguette at a 45 degree angle in 1/2-inch-thick slices. Brush both sides of the bread with olive oil and bake for 6 minutes, until lightly toasted. Take the slices out of the oven and rub the surface of each one with the cut clove of garlic.